Microwave the potatoes and onion for 2 minutes on high in a covered microwave container. Add frozen peas and cook a further minute. 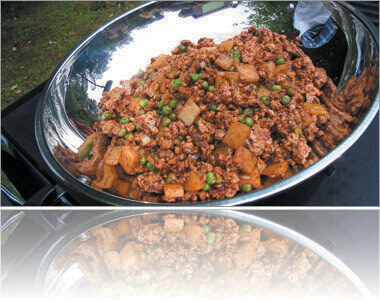 Meanwhile heat the oil in a wok or frypan and stir-fry the mince for two minutes or until browned. Add the Lee Kum Kee Ready Sauce for Black Pepper Beef – if its good enough for beef its got to be good for pork. Add in the vegetables and stir-fry for one minute until sauce thickens. Pork mince has a delicate flavour and so is ideal for all Asian recipes. Prepared Ready Sauces for Chicken and Beef can also be used with pork. For some added colour get creative with chopped red capsicums.